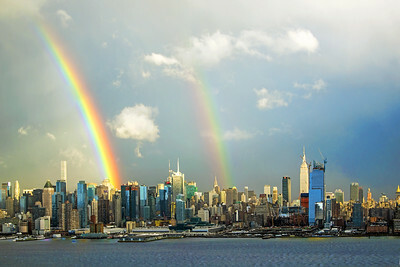 Images of the New York Skyline with rainbows appearing after a storm. 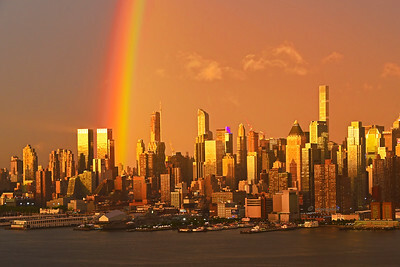 A view of midtown Manhattan skyscrapers, the Hudson River and a distant rainbow as sundown light turned the city to gold. 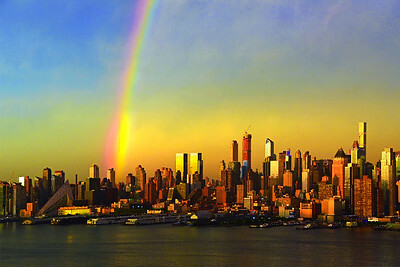 A beatuful rainbow appears as a nasty, windy thunderstorm departs just at sunset time - the end result an amazing rainbow cityswcape of the NYC skyline and Hudson River..
A vertical format view of the midtown west side of Mahattan and Hudson River as a late afternoon thunderstorm clears out to produce a beautiful rain just at sundown time when the buildings are reflecting the sundown colors and the clouds are tinted with the rainbow colors. Just beautiful to see from across the river in New Jersey. 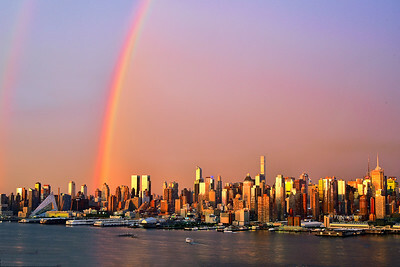 Sundown and a rainbow as a thunderstorm clears away create a color and atmospheric combination that makes the NYC skyline and the Hudson River seem to glow. 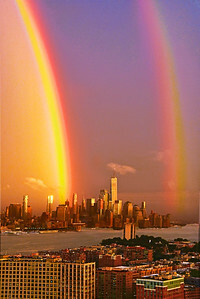 Here is a view looking sourth down the Hudson River over the city of Hoboken N.J. across the river to lower Manhattan. 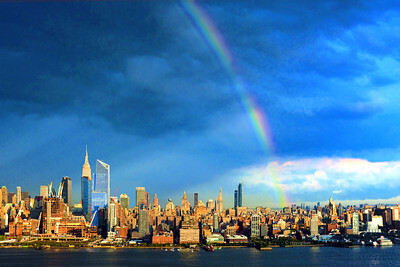 One rainbow, still in storm haze and clouds, shows behind One World Trade Center. 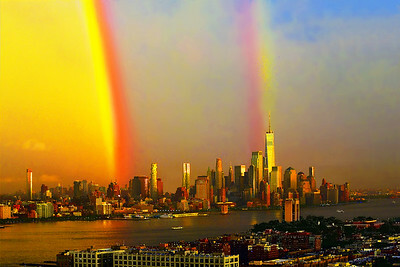 A double rainbow over lower Manhattan and One World Trace Center after a late afternoon strom on July 4th weekend. A fiew of a double rainbow over upper midtown Manhattan with the Hudson River in the foreground taken after a late afternoon storm. Seen from across the river in New Jersey. 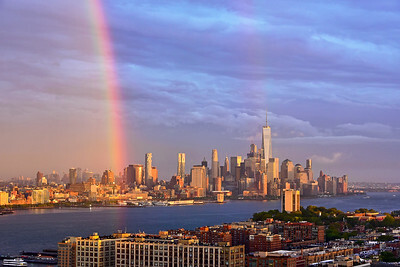 A view of the Hudson River, Hoboken N.J. and the lower Manhattan skyline, including One World Trade, with a double rainbow as a storm cleared at sundown creating incredible golden skies and ultra colorful rainbows. 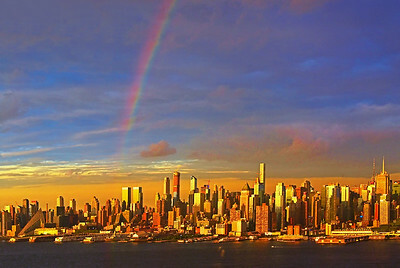 A view of upper midtown Manhattan and the Hudson River at sundown with a stunning rainbow as storms cleared. 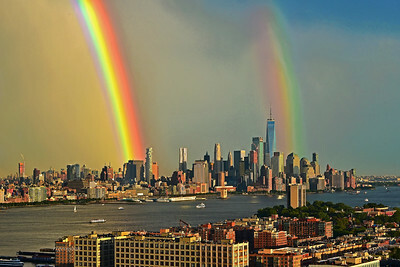 A vertical format view looking south over the buildings of Hoboken New Jersey and the Hudson River to lower Manhattan and One World Trade Center framed by the southern ends of double rainbows. 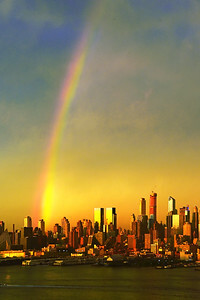 The rainbows appeared at sundown during the golden hour just after a series of rainstorms passed through the area. 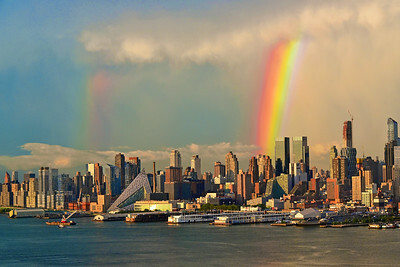 A view of midtown Manhattan west side and the Hudson River as a stunning double rainbow framed the city in fantastic light and color at sundown. 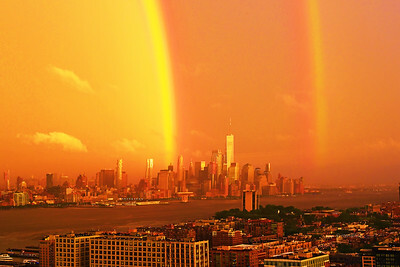 A view of the Hudson River and the west-side New York City skyline as a huge rainbow appeared after a thunder storm at sundown. 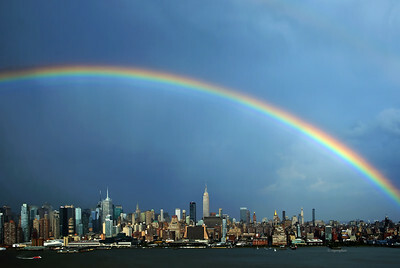 Viewed from New Jersey. 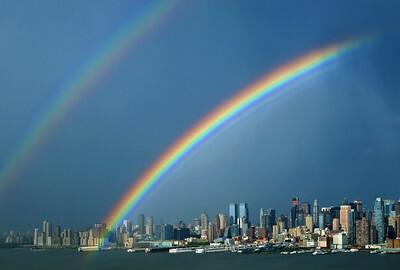 A horizontal format view of Hoboken and Newport Jersey City, NJ, in the foreground, the lower Hudson River and lover Manhattan in the background with a glowing rainbow and deep blue storm skies. The time is during the golden hour of sundown just after a heavy thunder storm passed through the area. 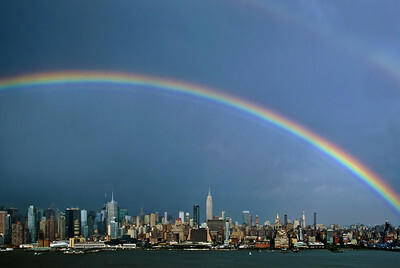 A view of the Hudson River and west side of the New York skyline as a storm was clearing and a double rainbow appeared over the skyscrapers of New York City. 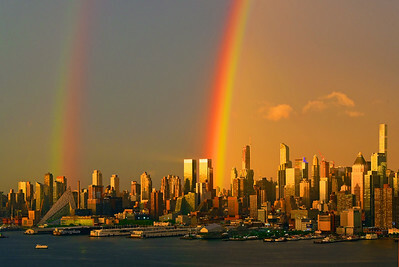 A view of the New York Skyline at sundown after a storm, with a rainbow reaching into the cloud filled sky. 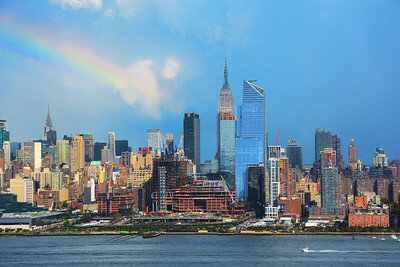 A hint of a partial rainbow above the New York Skyline, way in the distance as seen from New Jersey across the Hudson River after a late afternnoon summer rain squall.